Learn how to make a velvet pumpkin with these step-by-step video instructions. These pumpkins are cute, and very easy to make yourself! As much as I hate to admit it, summer is almost over! 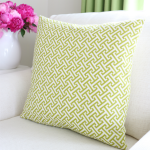 It’s time to start thinking about decorating for fall! 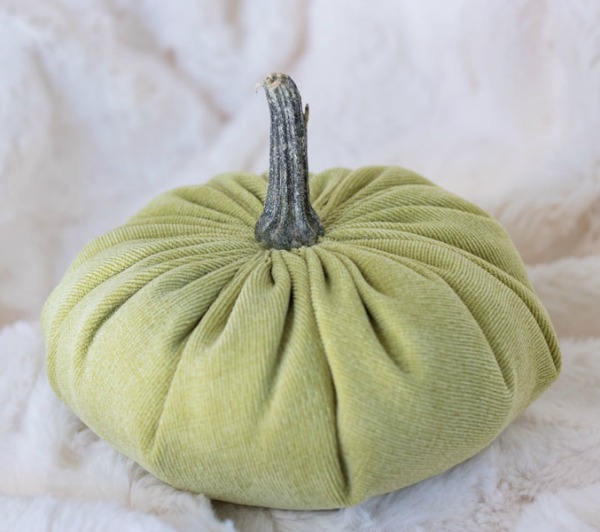 I’ve been noticing cute velvet pumpkins in the stores and on-line the last couple of years, but haven’t bought any because they can be expensive. 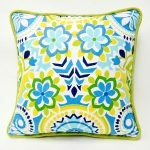 I always think to myself – I can make that! 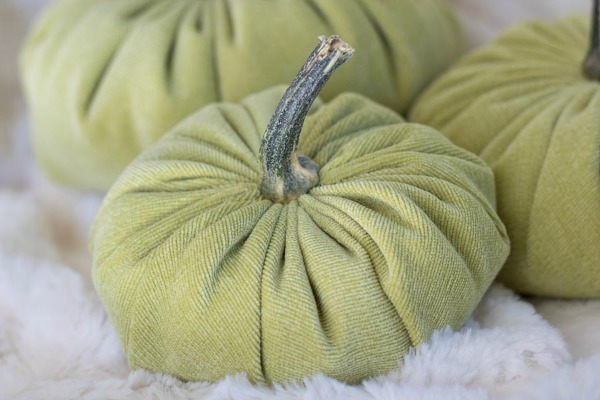 Recently I did figure out how to make them, so today I’m sharing my how to make a velvet pumpkin video tutorial, so you can make your own too! Round objects to make your circles – plates, bowls or even pizza pans. My 3 sizes are 10″, 12 1/2″ and 15″ in diameter. Stem – I saved stems from last year’s pumpkins. You can also ask at a pumpkin farm, or use stems from butternut or acorn squash. Cut out your circle shape. Thread needle and knot double strand. Hand sew a basting stitch all the way around the circle of fabric. Gather up fabric. Place 1/4 cup of rice or beans in the bottom of the pumpkin. Fill the pumpkin with polyfill. Tighten basting stitches to close the pumpkin. 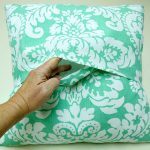 Make a couple of stitches across the opening to help close it. Take a stitch to the bottom of the pumpkin and back up to the top. Knot your thread. Hot glue the stem onto the pumpkin. Covering the opening and stitches. 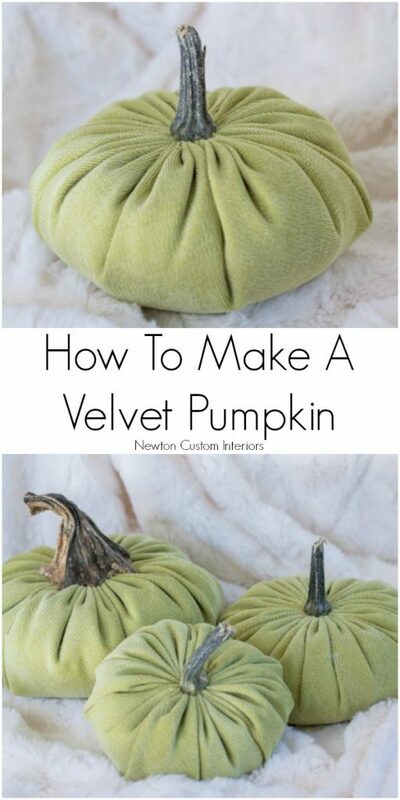 I hope you’ve enjoyed this tutorial for how to make a velvet pumpkin! Wow, what cute pumpkins, I loved the video. It’s smart to show it with a contrasting thread so we can easily understand the tutorial. I need to try my hand at making some of those. Thanks Toni! They’re very easy to make! I found you on you tube and followed the velvet pumpkin… after I hunted all over for instructions on how to make them and WOW!!! You rock!! I appreciate your way of teaching! Please come to Baltimore, MD and teach a class with all your creative ways!!!! We need you here!!! I work at a large craft store chain and we would love you!!!! Thanks Amy! That’s very sweet! I would come if I lived closer!